(CNN) –Sen. Robert Menendez is finally giving the go ahead to one of President Obama’s high profile judicial appointments, ending the New Jersey Democrat’s showdown with his own party that some attributed to a personal grudge. In a statement released Friday, Menendez said he was dropping his opposition to Judge Patty Shwartz’s nomination to the Third Circuit Court of Appeals. Obama nominated Shwartz to the prestigious court nearly three months ago. 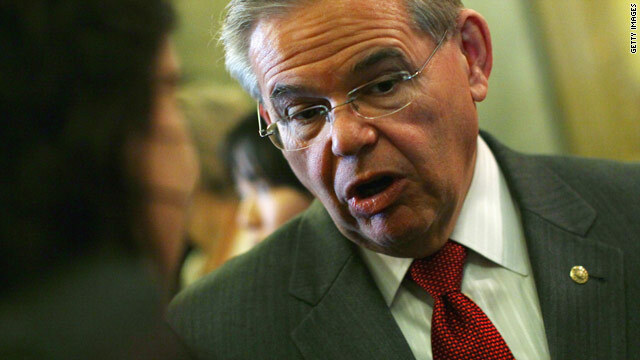 Menendez, who as Shwartz’s home-state senator has the power block her nomination, originally expressed concerns with Shwartz’s understanding of certain areas of campaign finance law following an initial meeting with her. But supporters of Shwartz suspected Menendez was actually motivated by a personal grudge with Shwartz’s longtime boyfriend, a federal prosecutor who investigated Menendez in 2006 over suspicion of corruption. No charges were filed but the investigation threatened to imperil Menendez’s Senate campaign that year. Menedez’s office strongly denied the holdup of Shwartz was at all related to her boyfriend, insisting that the senator was instead concerned she wasn’t suitable for a post on the powerful Third Circuit. But following intense media pressure, Menendez agreed to meet with Shwartz a second time Friday, during which the current district court judge appears to have allayed Menendez’s concerns over her legal suitability. “Judge Shwartz satisfactorily answered questions covering important legal topics such as current law on the rights of corporations under the First Amendment, constitutional limits on Executive Branch power and the application of heightened standards of review under the Constitution,” Menendez said in a statement. I see the CNN hispanic Censors are at work again.do not like the truth do you. AND Michelle is not a Funny Person! Neither do all the Librerals/Progressives/Commies and Socialist. Randy, the last couple of times I have listened to her,,, is talking Private Parts! Wow, you are clever aren't you. Perhaps not too bright but funny in a stoopid (sp) kind of way. I see the meds are kicking in. Please go lie down and do not operate any heavy machinery. Don't worry. The nice men in the white coats will be here soon to take you to a quiet room. It is really interesting that folks here have never heard of Randi Rhodes. If you have listened to her, you would agree that what I typed above is about an exact quote of Ms. Rhodes! ALL TO SHOW HOW DUMB the CONSERVATIVES ARE. But, she is the dumb one. She and Al Gore are good friends, two peas in a pod. They are slamming Randi Rhodes! HA HA HA,,, Rhodes and her private parts! ha ha ha,,, NASTY HUMOR! Where is Weiner when you need him!!! NEW YORK – – – WAKE UP! Never heard of Rhandi Rhodes. About time Sen. Robert Menendez . Senator can you be any more small minded? i mean about,,,, I am killing myself! Randi Rhodes is so funny NOT! No, Tim CA he is just a teepitty idiot who has swilled too much poison tea. The Liberals do not like having folks pea down thier legs and tell them that it is raining! HA HA HA! I am not Randi, the Russians are Randy! Here's a novel idea, Mr. Free World, bring up something relevant, OK? These sound like issues a REPUBLICAN would be concerned about!!! "Judge Shwartz satisfactorily answered questions covering important legal topics such as current law on the rights of corporations under the First Amendment, constitutional limits on Executive Branch power and the application of heightened standards of review under the Constitution." When is this guy leaving? I don't consider him ah true democrats he's suppose to support the president and his party! That's why washington is ah mess with senators like this guy! Is this representative or Senator a lawyer? If not automatically Obama's nominee is more qualified as a judge to speak on an obiter dicta basis than Menendez ever will be. That one person in a state can hold up a presidential appointment irrespective of party is why we have so much gridlock in the system. So term limits seems like a good idea and avoids the necessity for so many useless costly delays in having a fully staffed government. We need much less people to be subject to senate oversight ... and approval Just security checks and qualifications for the job. So if he does not step in line, then he all over sudden becomes an undesirable. "Agenda is the most powerful expose of the communist, socialist, progressive attempt to take over America produced so far." When Idaho legislator Curtis Bowers wrote a "Letter to the Editor" about the drastic changes in America's culture, it became the feature story on the evening news, people protested at the capitol, and for weeks the local newspapers were filled with responses. He realized then that he'd hit on something. It's not just another conspiracy theory. It's a well-documented agenda. Ask almost anyone and you will hear, "Communism is dead! The Berlin wall came down." But although the word "communism" has fallen out of favor, Marxism continues to have a powerful influence upon our nation, as this new film quickly reveals. Join Bowers for a fascinating look at the people and groups that have successfully targeted America's morality and freedom in their effort to grind America down. Just wondering if anybody here has seen the movie???? Looks like it might give us insite into the Liberals. Any Liberals here see the movie yet? Democrats are supposed to be brainless robots marching to Obama's orders. What happened? Menendez is a brainless robot. When they were passing out brains he heard trains and left the station. @Rickypoo McDanielburger, it ain't Dems that are brainless bots. Everyone has known for a couple of decades, that honor belongs solely to Rethugs. And yet this year they seem to be less assimilated than usual. Can it be? Are they becoming actual human beings? Oh Charlotte, it is just a temporary illusion that Rethugliklans are self-thinkers, watch them morph into perfect little mindless bots behind their candidates. You want your children and grand-children to pay for the welfare of Illegals Crossing the Border? You want your children and grand-children to pay for Health Care for the Illegals Crossing the Border? You want your children and grand-children to pay for MY HEALTH CARE ??? To pay for MY HEALTH CARE???? so that I can survive in this world! Here are some crazy lefties. Check it out! Animal rights activists have claimed responsibility for the Sunday arson fire that heavily damaged 14 tractors and several cattle trailers at Harris Farms in Fresno County, California, according to a clearinghouse for activists. Republicans"self thinkers", not at all except for being obsessed by their own profits, regardless of millions of poorer and unemployed Americans. It is not self thinking as Romney would call it. Rather it is ruthless selfishness. First and foremost you are a moron to equate people who belong to any animal rights group as only being lefties. I know several very right-wing leaning people who are vegans. I'm sure the ALF is made up of a mix of other political beliefs. That being said, I find the people who agree with the basic philosophy of the animal rights groups more often hold the same ideas as those of the right-wing in the anti-abortion movement. Look up Brigitte Bardot animal rights, Michael Singer of the ALF. Bardot although being an animal rights activist held very right-wing views on immigration and abortion. Type famous right-wing animal rights activist in your google search and you will hit the mother lode. Look up Bardot's husband Bernard d' Ormale and his connect to the French National Front Party (Nazi movement). This quote from Vanity Fair in 2004 about Bardot. "She still lives in La Madrague, with nine dogs, 40 cats, horses, and husband Bernard d'Ormale, an executive in Jean-Marie Le Pen's far-right National Front. Her love for animals is matched, it seems, only by her hatred for mankind. .". This guy is supposed to march lock step with Obama and not think for himself. I wouldn't say what you said, but certainly shouldn't hold up an appointment because of a personal grudge. Love senators who think for themselves, but to have your personal feelings on a personal matter do your bidding is disgraceful. Term limits? I wonder if that may cause more outrageous behavior since there would be less to lose. finally the pres needs all the help he can get. About time this dem stopped acting like a repo clown and rejoined the party. The repos have enough crazyness,we don't need to follow . Look at the loonies that have written in today. This has what to do with this story? What does any of this have to do with the above article...other than you wanting to show us you are crazy? Sorry George, this was meant for the Free Idiot.